Even though companies such as IBM make it easier to centralize the management and security of mobile devices of various shapes and sizes, that is no excuse for capitulating to the whims of the masses, to bolster your career by trying to be hip and trendy and au courant. If you allow progress here, next thing you know, the company will be asking you to enable business in the cloud. Where will it all end? 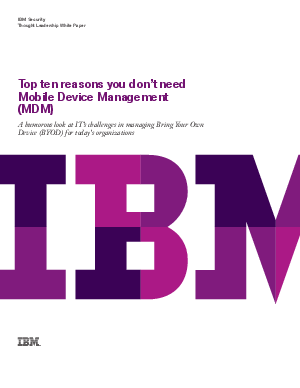 So, before you take that fatal next step in allowing mobility, security, BYOD and user flexibility, carefully read these top 10 reasons why you don’t need mobile device management.